It’s not uncommon for food samples to inadvertently become contaminated with control strains used in the laboratory. This leads to false-positive results which can have severe financial and regulatory implications. UV-BioTAG, our line of reference strains containing green fluorescent protein (GFP) markers, makes is easy to distinguish standard microorganism strains from laboratory control strains. Optimized for highly visible fluorescence, UV-BioTAG strains provide better stability because the GFP marker is integrated into the chromosome rather than the plasmid. 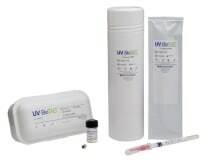 With UV-BioTAG, you can quickly and reliably establish whether a positive test result can be traced back to a control strain cross-contamination issue, or if it is from another source.